I think they like me here! Why do I think that? Because Mick jumps with joy from his chair when he sees me and shouts “Oh, its Adnan!”, while Wally shakes my hand with “Good to see you, brother…” and Richard keeps trying to involve me more and more in the archery scene of the UK. Thanks to Richard I am now a member of the Longbow Heritage Club headed by Carol as well as a member of the NFAS (National Field Archery Society). Richard also was kind enough to (relentlessly) talked me into attending this weekend’s event organised by Longbow Heritage. So it was that I ended up being the first thumbring shooter ever at an NFAS event this Saturday, 31st of August 2013. I had been working myself to exhaustion when Richard contacted me last Monday through Facebook, to invite me to the event at Fort George. He convinced me that a little “bow and arrow therapy” would do me good. I concurred but couldn’t give him a definite answer until it was midweek. See, I had a deadline for a project I was working on and the review on Wednesday would determine whether I would have to work through the following weekend or not. Fortunately, I didn’t have to. So, I boarded a Friday evening train from Waterloo at 19:50. 90 minutes later I was welcomed by Richard and Collette at Salisbury train station. Salisbury is a medieval town in the southwest of England. It looks like a place I definitely would like to explore a little further at a later date. Apparently the tallest spire in the UK belongs to Salisbury Cathedral. It is quite an impressive sight and even at night time its intricate details are visible from afar. After a nice pizza eaten at the town square, we made our way to Fort George in Romsey. Imagine little boys playing Cowboys and Indians, building forts out of cardboard boxes. Now imagine those boys growing up and building an actual fort! 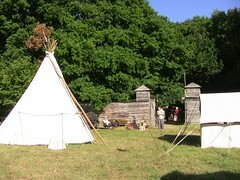 That is what Fort George is, a boys fantasy as well as a venue for wild west en-actors. Mick – whom I secretly nicknamed Yoda, because he turns from this senior person with walking difficulty to Yoda with a light saber when he is about to shoot his bow (or when he is excited) – told me at the campfire that Fort George was actually built 25 years ago. I guess its just another example of how seriously people take their pastimes in this eccentric country. After a few Belgian beers with Richard, we decided it was time to call it a night. On the way to my tent I did get a chance to marvel at the sky, absent city lights. Although I am no stranger to the experience, it always amazes me not being able to find a starless spot on the black dome. Towards 18:00, I said goodbye to old friends as well as new ones and Richard took me to the train station to begin my journey back to London, sweet London. Many of the archers, including my team mates, stayed another night for an event planned on Sunday, the pre-championship warm up shoot. In short, I had a great weekend. However there is one thing that troubles me. How will I manage to adapt back to daily life after so much fun?